The United States has made significant strides in the adoption of health information technology among health care providers and hospitals, yet has not achieved many of the promised gains. Even as national roadmaps and proposals are addressing Health IT interoperability, there is a growing call to include partners beyond the health care sector. According to McGinnis et al (2002), only 10 percent of premature deaths are attributable to shortfalls in medical care, with health behaviors, social and economic factors, physical environment, and genetics accounting for the rest. 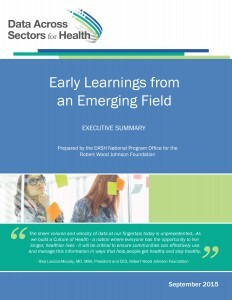 Non-health sectors that are contributing to this field include, but are not limited to, social services, housing, education, transportation, community safety, community development, the physical environment, and business/employers.These sectors are representative of the social determinants of health, and their inclusion deepens understanding of the health of communities, and provides additional and optimal avenues for action. DASH will work to foster alignment among health care, public health and other community systems to address the multiple determinants of health and improve the health of communities. In 2015, Data Across Sectors for Health (DASH) conducted an environmental scan of the state of multi-sector data sharing initiatives aimed at improving community health. Monitoring and analysis is ongoing, but the initial findings show a vibrant and diverse set of initiatives exist across the country. The results, summarized in this executive summary, provide context on the landscape in which DASH and similar initiatives are working.